In 1945, after receiving the Nobel Prize for his chance discovery of miracle cure, penicillin antibiotic, Alexander Fleming issued a warning. “There is the danger that the ignorant man may easily under-dose himself and by exposing his microbes to non-lethal quantities of the drug make them resistant,” he said. Since the discovery of penicillin, scientists have made antibiotics to cure multitudes of diseases—tuberculosis, typhoid, urinary tract infection, septicaemia, and the list goes. But Fleming’s warning continues to haunt them. More so, because antibiotics are no more restricted to humans nor limited to treating diseases. In poultry, for instance, the industry has found another use for antibiotics: as a growth promoter. Chickens are fed antibiotics so that they gain weight and grow fast. Public health experts have long suspected that such rampant use of antibiotics could be a reason for increasing antibiotic resistance in India. But the government has no data on the use of antibiotics in the country, let alone on the prevalence of antibiotic resistance. A recent study now confirms what has for long been suspected. Delhi non-profit Centre for Science and Environment (CSE) has found residues of antibiotics in 40 per cent of the chicken samples it tested. This suggests that the chickens were exposed to antibiotics throughout their short life cycle of 35-42 days. The Pollution Monitoring Laboratory of CSE tested 70 chicken samples procured from 16 markets in Delhi and the National Capital Region. Three tissues—muscle, liver and kidney—were tested for the presence of six antibiotics widely used in poultry: oxytetracycline, chlortetracycline and doxycycline (from class tetracyclines);enrofloxacin and ciprofloxacin (from fluoroquinolones) and neomycin, an aminoglycoside. Residues of five of the six antibiotics were found in the chicken samples. The antibiotic residues were detected in all the three tissues. They were in the range of 3.37-131.75 µg/kg. Of the 40 per cent samples found tainted with antibiotic residues, 22.9 per cent contained residues of only one antibiotic while the remaining 17.1 per cent samples had residues of more than one antibiotics. Liver samples contained the maximum antibiotic residue, followed by muscle and kidney tissue (see ‘Know the chicken you eat’). To understand any seasonal variation in the levels of antibiotic residues, CSE researchers conducted the study in two phases: first during September-October 2013, and then between May and June 2014. The findings were alarming in both the phases. They suggest an indiscriminate use of antibiotics in poultry. “Repeated and prolonged exposure to antibiotics lead, by natural selection, to the emergence of resistant strains of bacteria,” says Neil Schluger, chief scientific officer, World Lung Foundation, New York. These mutated robust strains bypass toxic effects of antibiotics, making them ineffective. They can easily spread among the flock raised in squalor and contaminate the food chain. They can also alter the genetic material of other bacteria, often pathogenic ones, making them resistant to several drugs and resulting in a global pandemic. Humans are at a double threat. The mutated robust microbe strain can invade the body and cause diseases that are difficult to treat. Secondly, antibiotic residues present in the meat can directly unleash an assault on microbes in humans. “Residues of antibiotics present in meat can easily find their way into the human body, where they can create resistant microbes,” says RandeepGuleria, professor of pulmonary medicine at the All India Institute of Medical Sciences, Delhi (see ‘Smart moves...’). 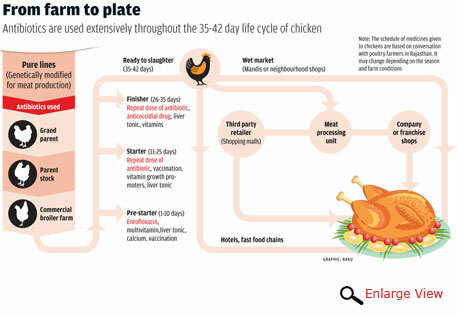 The scale of threat can be gauged from the fact that antibiotics are frequently pumped into chicken during its life cycle: they are occasionally given as a drug to treat infections, regularly mixed with feed to promote growth and routinely administered to all birds for several days to prevent infections, even when there are no sign of it. “Finding antibiotics in chicken is worrying because several antibiotics used in poultry are also used in human beings,” Guleria adds. To ascertain the linkage between overuse of antibiotics in poultry farms and antibiotic resistance in humans, CSE researchers reviewed 13 studies conducted by various government and private hospitals across the country between 2002 and 2013. The result was startling. Resistance was very high against ciprofloxacin, doxycycline and tetracycline. In certain studies reviewed by CSE, almost all of Pseudomonas, Enterobacter, Escherichia Coli and Klebsiella were found to be resistant to ciprofloxacin (see ‘Bacteria have become highly resistant...’). “Resistance to antibiotics is a major crisis that is going to hit the healthcare sector soon,” says Devi Shetty, cardiac surgeon and founder of Narayana Health, a charitable hospital (see interview). “Not long ago, I treated a patient with drug-resistant tuberculosis,” says Schluger. “What could have been a simple six month course of treatment turned into a two-year ordeal which involved drugs that damaged the patient’s hearing and nerves. Major surgery was required to remove diseased areas of his lung,” he adds. With drugs losing their effectiveness, the world would need newer antibiotics. Unfortunately, no new class of antibiotic has hit the market since late 1980s. In the US, more than 2 million people suffer from antibiotic-resistance-related illnesses every year; 23,000 of them succumb to the diseases. Annual healthcare cost due to antibiotic resistance is estimated to be as high as $20 billion, with an additional productivity loss of up to $35 billion in the US. No such estimates are available for India, but cases of high antibiotic resistance are emerging from across the country. 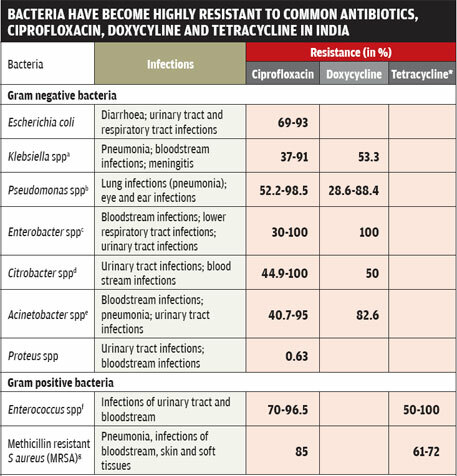 VipinVashishtha, who runs Mangla Hospital in Bijnor, Uttar Pradesh, writes on the pervasiveness of antibiotic resistance in the February 2011 issue of Indian Paediatrics. Bacteria found in 14 infants at his hospital were resistant to all classes of antibiotics—cephalosporins, aminoglycosides, monobactams, quinolones, piperacillin-tazobactam combination and carbapenems. These children were administered expensive antibiotics like polymyxin B and colistin, but only eight could be saved. Four of these eight developed complications like meningitis and arthritis, he wrote (see ‘Fatal resistance,’ Down To Earth, October 16-31, 2011). Guleria elaborates. Antibiotic resistance leads to two problems—mild infections require stronger dosage and no effective antibiotics are left for treating severe infections. Resistance to a class of antibiotics, for instance fluoroquinolone, has fatal consequences. Fluoroquinolone antibiotics are prominently used to combat infections in intensive care units. Treating fatal diseases like sepsis, pneumonia and tuberculosis (TB) are becoming tough because microbes that cause these diseases are increasingly becoming resistant to fluoroquinolones. “We are receiving reports of multi-drug-resistant TB (MDR-TB) and extreme-drug-resistant TB (XDR-TB), ” he adds. Replying to a question in Parliament recently, Union health minister Harsh Vardhan said that the number of MDR-TB cases in the country has increased five times to 23,325 between 2011 and 2013. CSE study found two fluoroquinolone antibiotics—enrofloxacin and ciprofloxacin—in 28.6 per cent chicken samples tested. For example, Skylark Hatcheries, an integrated poultry company in Jind, Haryana, uses Enramycin. Venky’s uses bacitracin in its feed Bamylate, while Vetline India uses furazolidone antibiotic in its feed Furavet. Some European countries ban the use of bacitracin and furazolidone as growth promoters. Antibiotics from classes of cephalosporins, penicillins and macrolides are also among the most popular antibiotics used in poultry farms in India. WHO classifies these antibiotics as critical for human use. The poultry sector in India has undergone a major change in structure and operation over the past two decades. From being a mere backyard activity, the sector of rearing broilers (those grown for meat) and layers (the ones grown for laying eggs), has expanded at 8-10 per cent a year in the past decade, according to a 2014 report by ICRA Ltd, an investment information and credit rating agency in the country. In 2013, its market size was Rs 58,000 crore. The market of broiler meat alone has grown at 10 per cent and now accounts for half of the market size of all meat, according to the Animal Husbandry Statistics, 2013. 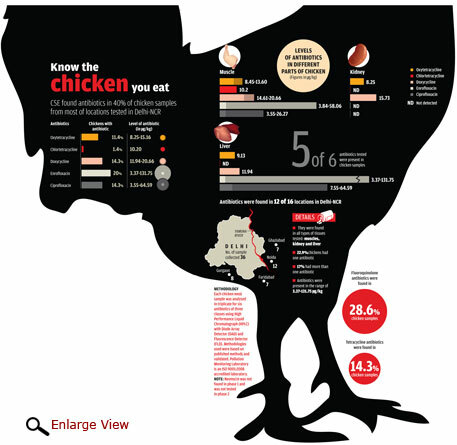 Andhra Pradesh is the biggest producer of poultry meat in the country. But the poultry industry of Haryana has grown at the fastest rate of 12 per cent in the past five years and has become a major supplier of meat to Delhi and NCR. Analysts say the sector received the impetus from large integrated players, who own right from the parent-breeder stock and hatcheries to farms for growing chickens, mills for manufacturing feed and facilities for processing and packaging meat. These players are expanding their business by giving contracts for growing broilers, which provide lucrative earning options to many communities, like those on the outskirts of Jaipur. In a village in Bagru municipality near Jaipur, one-third of the households have taken up poultry farming since Simran Farms Ltd, an Indore-based poultry company, approached them three years ago for growing broilers on contract basis. “The company said it would provide everything, right from the day-old chicks to feed and medicines, and pick up the ready-to-slaughter birds on the 35th day. All we had to do was to take good care of the birds, for which Simran Farms offered us Rs 11-13 per bird. Only a fool would have rejected this opportunity,” says Bhanu Jangid (name changed), a resident. Each family in the village rears between 3,500 and 5,000 birds and earns between Rs 25,000 and Rs 40,000 a month. “We had never seen this kind of money,” says Ajay Ranawat (name changed), an office boy-turned-poultry farmer, who has a farm of 5,000 broilers. The number of poultry farms is growing in this municipality, which already boasts 120 farms. 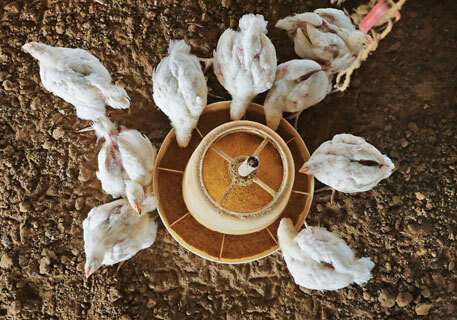 These poultry keepers blindly follow instructions of Simran Farms to keep the birds healthy and fat. After all, every kilogram of meat counts in poultry business. “As soon as the day-old chicks arrive, we give them 1 ml of Enrocin mixed with a litre of water for three days,” says Jangid. “The medicine is repeated after every 15 days for three days,” he says with an almost clinical precision. Enrocin is the brand name of Pfizer’s antibiotic enrofloxacin. Should not antibiotics be given only to sick birds? “The company has asked us to administer antibiotics beforehand. There is no point wearing helmet after one meets with an accident, is there?” Jangid asks with a chuckle. Antibiotics are also used as preventive measure at Central Poultry Performance Testing Centre (CPPTC) in Gurgaon, which is believed to maintain high standards of hygiene and maintenance. “The biosecurity measures are very important to keep the farms free of infection, but do not provide complete safeguard from infections,” says an official with CPPTC. To cater to the growing demand, even poultry feed manufacturers add antibiotics liberally to the feed. These feeds contain a variety of antibiotics and are available mixed with vitamins and other feed supplements. 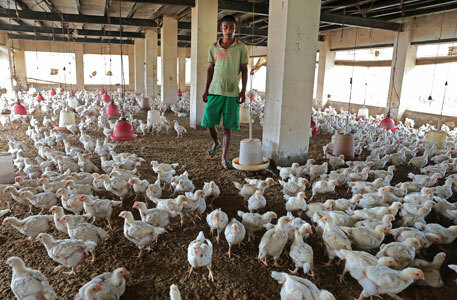 Many small-scale poultry farmers, like the ones in Bagru, are not sure whether the feed supplied by Simran Farms contains antibiotics. Repeated calls to representatives of the company yielded no response. Then there are other poultry farmers who feed antibiotics to the flock assuming that it is a feed supplement. While visiting Haryana’s premier Lala Lajpat Rai University of Veterinary and Animal Sciences (LUVAS) in Hisar, DTE met a poultry farmer who had travelled 45 km from Bagla village with his dead chicken. He wanted veterinarian Gulshan Narang to ascertain the disease so that he can administer medicine to his flock. “I do not give medicines to my chickens without consulting a veterinarian,” he said, adding in the same breath that he gives only gentamicin to the day-old chicks as soon as they arrive in his farm. He spoke the second sentence in a matter-of-fact manner without realising that gentamicin is a powerful antibiotic. “When I started my farm of 6,000 chickens eight years ago, other poultry farmers in my village told me that gentamicin is a must. So I use it,” said the farmer who did not wish to be named. What’s more, antibiotics are easily available over the counter. A DTE reporter, posing as a poultry farmer, visited two wholesale feed supplements and veterinary medicine shops in Karnal district of Haryana and asked for a kilogram of ciprofloxacin. The shopkeeper presented the antibiotic loosely wrapped in a polythene. It obviously had no mention about the date of manufacturing, expiry or cost. He charged Rs 2,000 for the drug that looked like wheat flour. When DTE enquired about the manufacturer, the shopkeeper said, “It is Chinese,” adding that he would not provide a bill. A Karnal-based dealer of feed supplement and medicines, informs DTE that small pharma companies manufacture such antibiotics and sell those to bulk drug markets such as Bhagirath Palace in Delhi. Antibiotics are also coming from China as the imports are not regulated. No one knows if it has expired or the amount of impurities in it. Drums of ciprofloxacin can be seen at poultry farms across Haryana, he adds. Poultry farmers also ignore the mandatory withdrawal period, time gap between the use of antibiotics and when it is slaughtered that helps ensure that high levels of antibiotic residues do not pass on to humans. In 2013, the Directorate General of Health Services issued a circular asking states to mention withdrawal period on the label of drugs. In case the withdrawal period is not mentioned, it should be considered at least 28 days in case of chicken, reads the circular. Gurgaon-based poultry consultant A Dua says withdrawal periods are never followed in other than therapeutic cases (treating the sick birds). 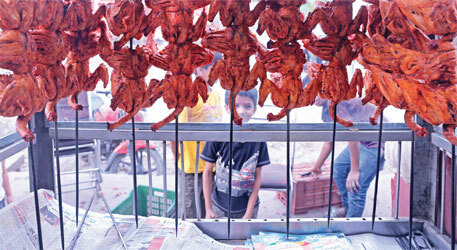 In certain cases, DTE observed, poultry farmers try to bypass the provision at the cost of public health. If disease strikes a flock three to four days before its scheduled date of sale, farmers sell off diseased chickens. They say giving antibiotics and then keeping the birds for the withdrawal period means they will have to be fed for a longer time, which is an expensive affair. Those involved in the business of growing broilers say antibiotics are a convenient way of producing cheaper meat. “As antibiotics kill microbes in the intestine, they help absorb feed nutrients better, resulting in weight gain,” says an official at CPPTC. On the pretext of preventing diseases, poultry farmers use antibiotics in feed to fatten the birds. However, there is no way to differentiate between prevention of diseases and growth promotion. Though the economy of a poultry farm gets affected by diseases, mortality and time taken to attain the desired weight (2 kg in 35 days), it is the feed conversion ratio (FCR) that can make or break a poultry farm. FCR is calculated by comparing the weight of all broilers with the amount of feed they consume during their life cycle. Poultry farmers, small or big, strive to attain lower FCR, which means less feed to attain the maximum weight. This indicates profitability. The easiest way to achieve low FCR is by feeding the poultry antibiotics. Satish Pal, president of Poultry Federation of India, explains cost of production and its relation to FCR. The cost of rearing a chick into ready-to-slaughter broiler is usually Rs 140. While the day-old chick costs about Rs 25 and expenses involved in labour, electricity and medicines come to around Rs 15, rest of the expenses go into feeding the broiler. Antibiotics are used by farmers to attain low FCR, he adds. Well-managed farms try to achieve an FCR of 1.5. A back-of-the-envelop calculation shows that at an FCR of 1.5, attained through antibiotic use, a chicken would eat 1.5 kg of feed to gain 1 kg of meat. By the time it attains the ideal 2 kg slaughter size, it would have consumed 3 kg of feed, which would cost about Rs 75. In case of an FCR of 2, it would consume 4 kg of feed, worth Rs 100. By keeping the FCR low, the farmers would save Rs 25 per bird. For a big farm of 100,000 birds, with an average seven rearing cycles a year, low FCR translates into a saving of Rs 1.75 crore a year. Given that the cost of antibiotics in feed is Rs 100 per tonne, the company will have to spend only Rs 2.10 lakh. 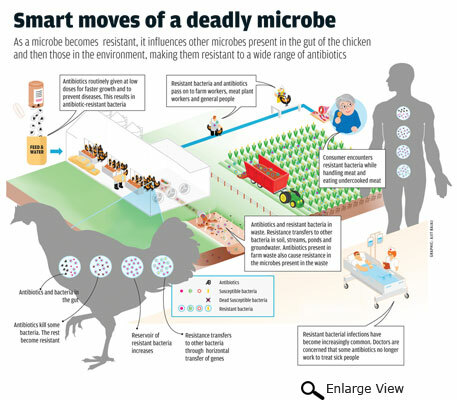 This is a huge incentive for poultry farmers to use antibiotics. “It is not possible to rear birds without using antibiotics or its alternatives such as probiotics or phytobiotics (plant extracts) that help maintain good gut health of the bird,” says Bijendra Sharma, nutritionist at Bhagwati Feeds Pvt Ltd, Sonepat. While many poultry farmers are aware of other options or antibiotic-free growth promoter feed supplements, their high cost is prohibitive for smaller players. Bigger farmers are less keen because there is no incentive to make antibiotic-free chickens. “The market does not offer premium rate for antibiotic-free chicken,” says Jagbir Dhull, director, Skylark Hatcheries. The company claims to have raised broilers without non-therapeutic antibiotic use for about five years before shifting to antibiotics. “Our cost of production has reduced by 20 per cent since we discontinued the herbal feed supplement, HYMU,” says Dhull. Pal, producer of HYMU, which protects broilers by boosting immunity, says Skylark is earning the dividends because it used antibiotics after five years. Its cost of production will increase as the bacteria would become resistant with every cycle, he says, adding, antibiotic-free supplements are cost-effective in the long run. How does antibiotic resistance affect treatment of patients? We are essentially going back to the pre-penicillin era. During the World Wars, soldiers used to succumb to even minor injuries because there were no effective antibiotics. Today, a plenty of antibiotics are available but a majority are not effective because bacteria have developed resistance towards them. This is a major crisis that is going to hit the health sector. We may do fancy operations and life-saving procedures on the heart and brain. People may sustain minor bruises and injuries. But all of them can die due to an infection by a bacteria that is resistant to antibiotics. Every country is vulnerable to this problem, which is going to strike the world in near future. Fortunately, or unfortunately, wealthy countries are more vulnerable than poor countries, because they are the ones abusing the antibiotics. What is the extent and severity of the problem? It is a major crisis. Today if you go to any hospital, a significant percentage of their patients suffer from multi-drug resistant bacteria. The worst thing is, it is not the patient who was hospitalised for a long time, or who has gone from one hospital to the other, acquiring various multi-drug resistant bacteria. It is the patient who walks from villages that are relatively clean, and is coming to hospital for the first time who is with resistant bacteria, even before the treatment. What do you think has triggered its emergence and spread? The spread is because our everyday food is contaminated with antibiotics. When we eat chicken, it is like taking a course of antibiotics. Fish and honey also contain antibiotics. Virtually all food has antibiotics. This was the case in Western countries. They took measures to control it. We need to do the same. Does the existing scientific knowledge establish the connection between antibiotic resistance and food? If we find bacteria like ESBL in the gut of somebody who has never stepped into a hospital nor taken antibiotics, then there is only one source of bacteria they could have got it from, and that is from the food. I can't think of any other source which could have given them enough antibiotics to produce resistance. What should the government and the industry do to respond to this increase in resistance? First of all, we do not have to reinvent the wheel. All we have to do is follow what Europe has done. There are standard protocols in many parts of the world about antibiotic usage in poultry farming. The protocols ensure that there is no trace of antibiotic when humans consume this food. We just have to implement it in our country. So, where do you think is the hurdle? There is really no hurdle. It is just that the government needs data and this data should come from a responsible body like CSE. When the government approaches the industry with regulations, the industry will be unhappy to some extent. They have one way of functioning, and regulations are going to disrupt that. But in the long term they will obviously be happy. Now, the government should be empowered with data from India. Before this study, there was no such data. The data will clearly show the magnitude of the problem of food contamination with antibiotics. Now the government can safely face the industry and say that we have the data to prove that this is the amount of antibiotics that is present in chicken or fish or honey. This will help the government take action. Citizens should be educated about what they are eating, what does their food contain, and what are the consequences. Because ultimately changes don't happen by the government or the policy makers.They are brought out by the citizens. So we should make every effort to educate people about the consequences of antibiotic abuse. Overuse and misuse of antibiotics contribute to the rise of antibiotic resistance. So do poor or unenforced regulations. India seems to suffer from both. So far, it does not have an effective integrated policy to control the use of antibiotics in livestock and poultry with a viewpoint of containing antibiotic resistance, except for a few sporadic initiatives that either do not target antibiotic resistance or lack teeth (see ‘India’s lax attitude’). The latest is a circular issued by the Department of Animal Husbandry, Dairying and Fisheries (DADF) in June 2014, requesting states to advise veterinarians on judicious use of antibiotics and to bar the use of antibiotics in feed. But it does not mention how to implement and monitor the advisories. Neither is there any mention of alternatives, time frame and punitive measures. When DTE asked DADF about how it plans to implement the advisory, assistant commissioner Sujit Kumar Dutta said, “Since animal health care and other animal husbandry practices are looked after by the state governments, it is their primary responsibility to implement the advisory in consultation with the state drug controllers.” Dutta, however, admitted that “not very substantive work has been done on antibiotic residues in animals”. In the absence of data on antibiotic residues, no one knows about the extent of antimicrobial resistance in the country. The only planned surveillance of antimicrobial resistance, under the National Programme on Containment on Antimicrobial Resistance, 2012-2017, is in humans and has not yet started. There is no apparent plan for integrated surveillance, including animals and food, which has been instrumental in containing antibiotic resistance in several EU countries. Even the 2011 National Policy for Containment of Antimicrobial Resistance overseeing the programme does not focus on resistance other than in humans, says Chand Wattal, chairperson of Department of Clinical Microbiology, Sir Ganga Ram Hospital, Delhi, who was a member of the task force that drafted the policy. “It was a waste of time. We had made presentation showing importance of containing resistance coming through poultry. But we were told the poultry industry will protest and the government cannot risk it. We cannot have half-hearted ways of dealing with a big problem like this. You cannot cover only half a route in science. Tough measures have to be taken,” he says. Governments worldwide are adopting regulations to control the use of antibiotics. But only those countries have shown signs of improvement that have taken stringent actions. European countries were the first ones to ban penicillin, streptomycin and tetracyclines as feed additives in the 1970s. In 1986, Sweden banned all antibiotic growth promoters in feed. Denmark, a major livestock producer in Europe and the largest exporter of pork in the world, followed the suit and started regulating the use of antibiotics in the early 1990s. Based on scientific evidence, it banned avoparcin, virginiamycin, tylosin, spiramycin and zinc bacitracin as growth promoters between 1995 and 1998. In 2002, it restricted the use of fluoroquinolones, a crucial antibiotic for humans, in animals. The cattle and broiler industry voluntarily stopped use of all antibiotics as growth promoters in 1998 and the swine industry followed it in 2000. Estimates show that the use of antibiotics has decreased by 90 per cent in poultry and 51 per cent in pigs between 1995 and 2008. Productivity of poultry farms was not affected during this time, while the cost of production remained almost same. 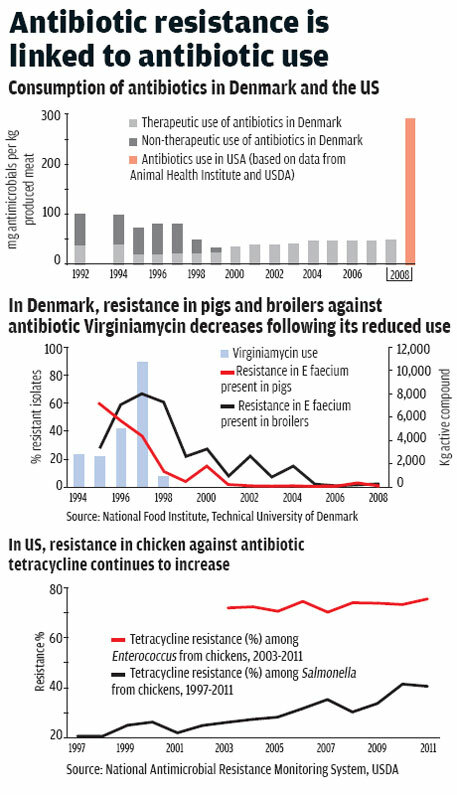 Antibiotic resistance significantly decreased in both broilers and pigs (see ‘Antibiotic resistance is...’). “We separated sale of antibiotics from veterinary advice, so that veterinarians had no economic incentive to prescribe large quantities,” says Jan Dahl, veterinary epidemiologist, Danish Agriculture and Food Council. “Vetstat (Denmark’s antibiotics database) was introduced to know what was used in the poultry farms. You cannot expect to change things if you have no information,” Dahl adds. Denmark’s success prompted the EU to ban all antibiotic growth promoters by 2006. The US, where 80 per cent of antibiotics (13,542 tonnes) are attributed to non-human use, recognised the problem around the same time as EU, but is far behind in addressing it. In 1977, the US Food and Drug Administration (USFDA) proposed banning tetracyclines and penicillins as additives in feed, but is yet to do it. Amid protests from public health advocates, USFDA introduced two policy documents in 2013 as guidances for the industry. Its objective was to phase out the use of medically important antibiotics in food-producing animals and bring therapeutic uses of such drugs under the oversight of licensed veterinarians. But unlike the EU, these guidances do not ban the use of antibiotics as growth promoters. In the name of judicious use theseguidances do not strictly control use of antibiotics in animals. While the initiative is considered an important first step, they are voluntary in nature. In recent years there is a significant increase in the use of lincosamides, penicillins and tetracyclines antibiotics. In chicken, resistance in select bacteria has been increasing against antibiotics of public health importance (see ‘In US, resistance...’). Resistance in Salmonella was also found to be increasing in retail poultry meat against third generation cephalosporins and ampicillin between 2001 and 2011. During the same period increased resistance was found in Campylobacter against ciprofloxacin. The Directorate General of Health Services issues a circular, asking state drug controllers to ensure that the withdrawal period of drugs meant for poultry and livestock are mentioned on packet. While it talks about regulating drugs, antibiotics as feed supplement remain out of its purview. 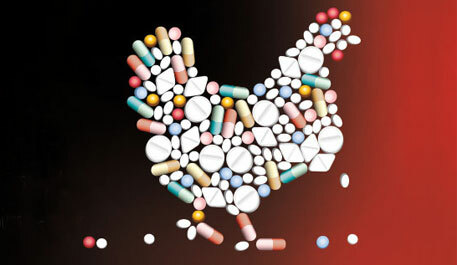 The worldis struggling to deal with antibiotic resistance emanating from the large-scale use of antibiotics in animals. This is largely because the regulatory mechanisms put in place by most countries (including the agency that sets global food standard, Codex Alimentarius Commission) are not designed to control antibiotic resistance; they are designed to reduce the level of antibiotics in food products. However, there is a tenuous link between antibiotics in food and antibiotics resistance in bacteria because of antibiotics overuse in animals. The current regulations on antibiotics in food are based on the concept of Maximum Residue Limits (MRLs), or the maximum amount of chemical permissible in a food item. It is based on the toxicity of the chemical—the more toxic is a chemical, the lower residues are allowed. But many times, MRLs are based on how much residue can be practically reduced in food item based on good practices. In most cases, it is a compromise between toxicity (health) and agricultural practices, including industry interests (wealth). Take the case of Codex standards for oxytetracycline antibiotic in chicken. The MRL is 200 µg/kg for chicken muscle; 600 µg/kg for liver; and 1,200 µg/kg for kidney. The standards for liver and kidney are higher than for muscles because antibiotics are more likely to persist in liver and kidney than in muscles. There is also a toxicity angle to these different standards. Since people eat more chicken muscle than liver or kidney, even a higher standard for liver or kidney means less exposure to antibiotics. This is a classic example of how standards are a compromise between health goals and industry interests. But the question is what is the relationship between eating a piece of chicken with 200 µg/kg oxytetracycline and the resistance of a bacteria to the antibiotic. The answer is, very little. The only plausible relationship is that eating chicken with residues of oxytetracycline is like taking the antibiotic in small doses. This might make microbes in the body resistant. But this is a tenuous argument because the MRL of 200 µg/kg is set not on the basis of antibiotic resistance but on the basis of toxicity of oxytetracycline, and there is no link between toxicity and resistance. So, just by setting standards for antibiotics in food items, we will not be able to solve the resistance issue, because the problem is elsewhere. The biggest problem is the emergence of resistant bacteria in the animal and its transmission through food and environment. A 2011 study by National Antimicrobial Resistance Monitoring System of US found that over half of the samples of ground turkey, pork chops and ground beef collected from supermarkets were tainted with antibiotic-resistant bacteria like Salmonella, E coli and Campylobacter. Consumption of these products, especially in raw form, are the most important route through which antibiotic resist- ant bacteria move from animals to humans. They can also transmit to humans through air, water and soil and through direct contact with affected animals and their meat. The bottom line is, till the time we keep misusing antibiotics in animals we will not be able to solve the problem of antibiotics resistance. So what should we do? Firstly, we need to learn from other parts of the world on what has worked and what has not. Countries that have relied on setting standards on antibiotics in food, like the US, have not been able to control antibiotic resistance. On the other hand, countries that have tried to reduce the use of antibiotics, like Scandinavian countries, have had success. This means India’s priority should be to put systems in place to reduce the use of antibiotics in poultry. This requires a holistic approach (see ‘Way ahead’). Keeping antibiotics effective is essential for the public health. We cannot afford to squander this essential public good in pursuit of profits. This is the bottom line. Lack of data on the use of antibiotics and drug resistance is a major problem in India. It is necessary to create an integrated surveillance system to monitor antibiotics use and antibiotics resistance trends in humans, animals and food chain. A national-level database should be developed and kept in the public domain.